Making Maple Candy in Snow. Image©Ruth Lor Malloy 2011. Have you ever been sugaring? As many of you know, one of Canada’s unique products is the syrup made from the sap of several varieties of maple tree. It is the sort of souvenir gift Canadians take to friends when we travel abroad. We also eat a lot of it in Canada too. Most of the syrup is produced in Quebec but the Toronto area has a couple of places where you can see how it is made. You can experience some maple-related culture n Toronto too, like horse-wagon rides. You should be able to sample yummy maple candy hardened in snow. You can learn why maple syrup is so expensive. The sugaring season goes from early March to early April here. The Kortright Centre for Conservation has the most comprehensive program, from March 5 to April 10. 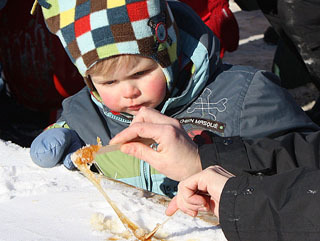 It is open daily from 10am to 4pm for its Sugarbush Maple Syrup Festival. It offers demonstrations, pancake breakfasts, and wagon rides. It’s at Pine Valley and Major Mackenzie Drive in Kleinburg. $9 for adults and $6.50 for seniors and children. Tel. 416-667-6295. The web-site is: www.maplesyrupfest.com. The Bradley Museum has a Maple Magic festival with syrup-making, guided tours, outdoor board games, and more. It goes from March 12 to 20, more or less. I couldn’t get exact information. In any case, it’s 12 noon to 4pm weekdays and 10am to 4pm weekends. $5.50. It’s at 1620 Orr in Mississauga. Tel. 905-615-4860. Web-site: http://www.mississauga.ca/portal/discover/bradleymuseum .